We're sorry; this specific copy is no longer available. 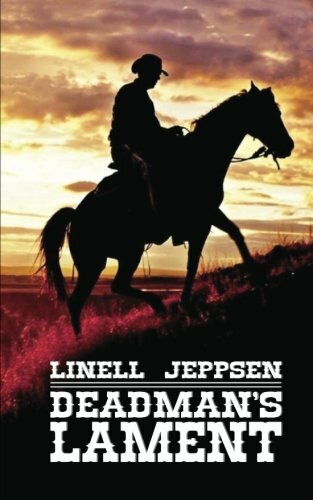 Here are our closest matches for Deadman's Lament by Linell Jeppsen. Synopsis: The year is 1872. Twelve-year-old Matthew Wilcox leads a charmed life on his family's sprawling ranch in Washington Territory, until a series of tragic events leaves him orphaned and in the clutches of a vicious outlaw gang. Threatened by the gang leader's perverted cousin, Top Hat, Matthew also faces Indian attacks, dangerous wildlife, and a deadly snowstorm. He survives, barely, but burns with an overwhelming hunger for revenge. Thirteen years later Matthew, now a Spokane County Sheriff, realizes that Top Hat is riding again - with a new gang called the Mad Hatters. It means risking his friends, his family and the love of a good woman, but Matthew must find the man who destroyed what he once loved most in the world. He and his posse venture into Idaho gold country to capture the Mad Hatters. Top Hat, however, has a different idea. He turns the tables, heading to the sheriff's hometown of Granville and going after everyone Matthew holds dear. What follows will haunt Sheriff Wilcox for the rest of his life as he confronts the hatred, vengeance and retribution buried deep in his own soul. Matthew will do anything, though, to put an end to ... A DEADMAN'S LAMENT.